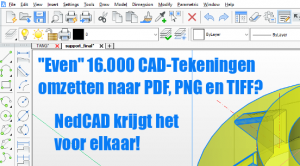 NedCAD's expertise: processing 16,000 CAD drawings within one week - NEDCAD Innovatieve CAD-oplossingen! From our client IFE Tebel Technologies, part of Knorr Bremse, we recently got the question whether we could quickly convert 16,000 CAD drawings to PDF, PNG, TIFF. A spreadsheet with all information about the drawings – such as revisions, scale and paper format – was required. Previous attempts by other parties with various utilities did not produce the desired result. The background to this story is that IFE Tebel Technologies wants to store its CAD drawings centrally in the document management system of Knorr Bremse in Austria. For distribution and easy readability, all CAD drawings that had ever been made had to be converted to a specific PDF format. In order to carry out this task properly, NedCAD has deployed a computer grid with CAD-optimized hardware and software. By using LISP and BASH scripts in Linux, the 16,000 CAD drawings could be prepared and exported in a number of batches. By first checking all drawings for errors and imperfections, and immediately solving them, the next steps were a matter of sufficient computing power. BricsCAD v18.2 was able to process 2000 drawings per processor per hour. The sizes of bitmaps of drawings increased up to 140 Mpixel. For many tens of thousands of cycles of opening, editing, and saving, BricsCAD has not crashed once. Interested in what NedCAD can do for you in this area? For more information contact us, without obligations.